Spray your way to a whole new look with the right paint and these tips. 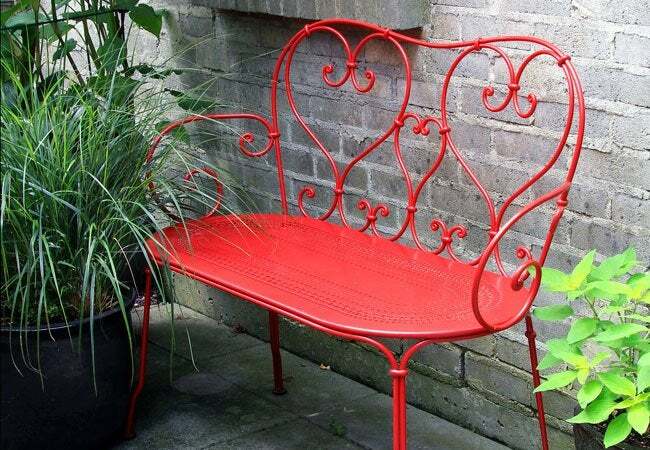 Metal furniture and ornaments are popular because they’re durable, but the longer a piece lasts, the older its look can become. Fortunately, everything from chairs and lamps to shelving and hardware can be spruced up with a fresh coat of spray paint. Generally speaking, the best spray paint for metal is hard-wearing enamel. Its oil base makes it somewhat slow to dry, but it stands up to cleaning and use well; many enamel paints are rustproof, too. Read the label or ask your retailer if suitable for your project. Then stock up: The average 12-ounce can should yield 8 to 10 square feet coverage, but if your retailer has a good return policy, consider buying more than you think you need. It’s easy to underestimate, and you don’t want to run out in the middle of a project. Proper surface prep is essential for spray paint adhesion, so sand or brush off all loose paint and rust spots. Because shiny objects seldom allow paint to bond well, use the metal brush and sandpaper to lightly scour and dull the surface till it looks lightly scratched, almost like brushed nickel. A very lightly scoured surface will help paint bond; don’t be overly zealous or you’ll get gouges or scratches. Wipe thoroughly with clean, dry cloth to remove any dust, dirt, and debris. You may need a water-dampened rag to remove stubborn crud, but ensure metal is 100 percent dry before painting. 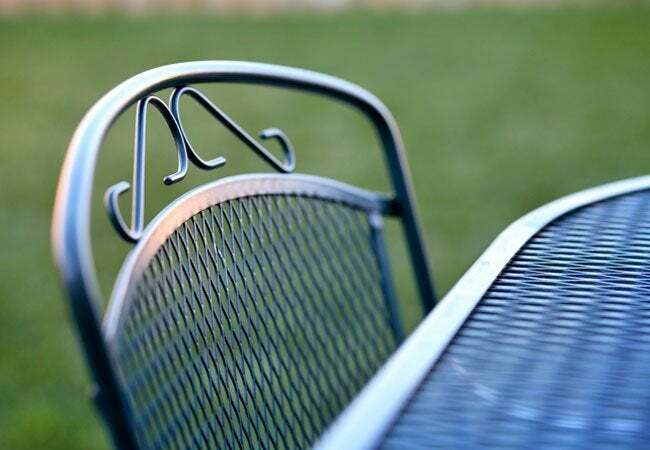 Prepare your work location, which ideally will be outdoors and protected from wind. Not only can wind blow leaves and pollen onto your project, it can literally push your paint around, causing uneven results. If working indoors, ventilate the area well, opening doors and windows. Move all furniture from the area or cover with drop cloths, and also protect floors with drop cloths or newspaper for as much as 10 feet around your work zone for large projects. Using masking tape, tape off areas of your piece that you want to keep unpainted. Get your mask, gloves, and goggles on and test your spray paint to ensure it provides a thin, fine mist. Shake the can vigorously for 45 to 60 seconds and spray onto a cardboard box or the bottom of your project. 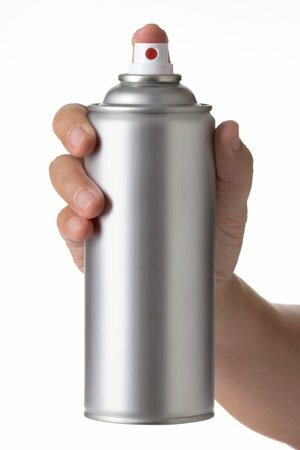 If you see spitting or uneven spray on a new can, return it for a replacement. Spitting can mean a malfunctioning nozzle, but it also might be a bit clogged; if dealing with a can of paint you’ve had for a while, try cleaning the nozzle with warm water. If that doesn’t resolve matters, dab lacquer or paint thinner onto the nozzle with a rag, then wipe it off and test it again. If your paint doesn’t include primer, follow the painting techniques in Step 6 with a spray primer formulated for use on metal, such as Rust-Oleum Metal Primer Spray Paint (view on Amazon). Allow it to dry thoroughly before repeating Step 6 for your first color coat. These techniques will ensure smooth, even results. Repeat with as many as three applications, working in light, even coats. Always begin and end spraying off your project, by simply spritzing the air beside it, to ensure that once paint hits the target, you’re shooting a steady, even, misting spray. Holding the can a foot from the painting surface, aim the light, fine mist on the object and sweep side to side or up and down to coat the width or length of your project. Each time you complete a single pass or row, stop spraying and give your can a quick shake for 5 to 10 seconds, then start spraying off the item before you do another pass. For every new spray, overlap with the last row of paint. Briefly shake the can regularly throughout the process. If painting larger items, like bookshelves or an iron fence, step along sideways toward the direction of your spray. If you only move your arm, you may not maintain the same density of spray. Pausing even briefly, or hovering, while spraying can create drips or spots. If this happens, remove all excess wet paint with a clean, dry, lint-free cloth. If you don’t notice these drips until after the drying process, sand them down with a fine-grit paper and dry-wipe the dust off. If you get paint on anything accidentally, use the label-recommended paint thinner or cleaning agent and a rag to clean up as soon as possible, before paint dries or cures. Then allow your project to dry thoroughly. Drying time varies by paint type, coat thickness, and even weather and humidity—it could take anywhere from three hours to overnight. Just be sure to wait 24 hours before using spray-painted items.